Madness can be induced in many ways. Mine certainly was exacerbated by the sudeen and unexpected death of my father when I was 37 years old. Tragedy struck our family on the morning of March 1, 1990 when my father keeled over from a stroke. Bereft, I wandered in a haze, halting in mid-step, bearings lost. It was dangerous for me to cross the street without first thinking how to accomplish the task at hand. A year and a half passed in that bell jar, my mother, Rose, even worse off than I. The dozens of hours I spent on the phone with her long distance from New York to Tennessee served mostly to just make my own pain effloresce. What could I do to distract we two? A trip to London might make sense, and when I mentioned it to her, it was like offering a cup of water to a woman who’d crawled on her hands and knees through a parched desert for days on end. The distraction of the trip would serve two purposes, comforting her, and taking me away from New York. My whole world was on fire, New York City the locus delicti where I’d carried on an extra-marital affair for a few months the previous fall, yet to become known to my wife and children. I felt rotten inside and seethed with pain. It was summer, 1992. London teemed with American tourists, the dollar being especially strong. Shopping seemed a pleasant distraction if Rose were otherwise occupied, so one steaming June day I trotted off among the antiques and collectibles stalls in Camden Passage and in the melee of Portobello Road. The mix of dowagers and Johnny Rotten look-alikes among my fellow browsers interested me just as much as the off-price bric-a-brac that bedecked folding tables in the crowded streets. A mesmerizing foreignness from even the most ordinary late 19th and early 20th century junk exuded from the strange labels of perfume phials, ceramic liniment jars, old pessary cases and the like. My legs ached and my brain fogged up after a few hours of meandering, but I pressed onward, looking for something truly rare. Though reluctant to enter the enclosed stores that lined Portobello Road and adjacent side streets, my foray into one jeweler’s shop paid a magnificent reward. I’ve always been magnetically drawn to the finest things in a dealer’s showcase. There lay a doozie: I asked to see an enameled medallion in the British royal colors, 3.5 cm in diameter, nestled in a silk-lined, antique velvet-clad case. Some items one simply must own. This exemplar had to be mine. Outside in the stalls, bargaining was de rigeur, despite the genteel British customs. Indoors seemed quite a different story, though. I imagined bad luck if I quibbled over pence and pounds. It’s sixteen years later and the receipt is misplaced, but I remember what I forked over. The sterling equivalent of $700 was a lot of money to me then. It still is now, but I’m glad I sprang for it. I’ve gotten my money’s worth many times over. “Love Cured the King” says the medal (in loose translation). Queen Charlotte is said to have been uncommonly devoted to the care and nursing of her illness-plagued consort. 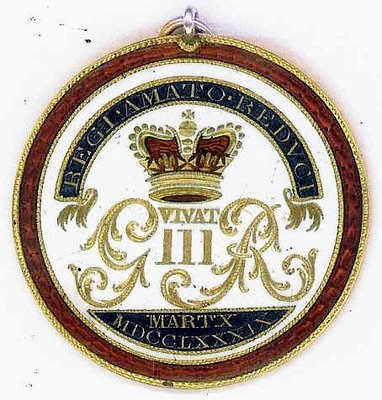 When the royal physicians declared George well on February 26, 1789, and after Parliament’s proclamation twelve days later, the Queen had several of these medallions privately fashioned and presented them to her favorite courtiers. Fanny Burney, Keeper of the Robes, recorded in her diary gifts to herself and Lord Harcourt in the early months of that year. A thanksgiving service was held at St. Paul’s Cathedral in London on April 23rd which the King attended, but out of concern for his health, he did not participate fully in the Recovery Balls that were held throughout England at private gentlemen’s clubs like the still-extant Brooks, and at fetes sponsored by foreign members of the diplomatic corps. The French and Spanish ambassadors vied to outdo each other, with the Iberian claiming victory when his guest list swelled to 2000, more than double the Gallic count. Two hundred years after that last quadrille, I held the Recovery Medallion in my hand, knowing that I could not leave the shop without it, though its cost would blow my budget sky high. My need for an amulet was as deep as the ocean of pain in which I was swimming. Something tangible might help me to tread water, to bob in the waves in which I might well drown. Sixteen years of shifting tides: my grief over my father’s death still resides in me, though not so much as in the early days of awe. The little jewel-box I brought home sits tucked in my wife’s upper dresser drawer. I open and check its contents now and again, touching that saddest of places I know. I rarely wear it out in public. It’s too decorative for my form. I had no idea of its precious provenance when I spied it in Portobello. But I knew it would help me get along. My wife cares about me as deeply as Queen Charlotte. I would come to know that, many moons on.